Detailed work covering faith, jurisprudence and character, belief in Allah, His Names and Attributes, the Quran, seeing Allah, punishment of the grave and events, the Divine Decree and more! Our brother Abdulilah will also be joining on Friday, and giving the Jumua Khutbah. Lesson Carrying the theme of having the correct understanding of matters, issues in the religion. 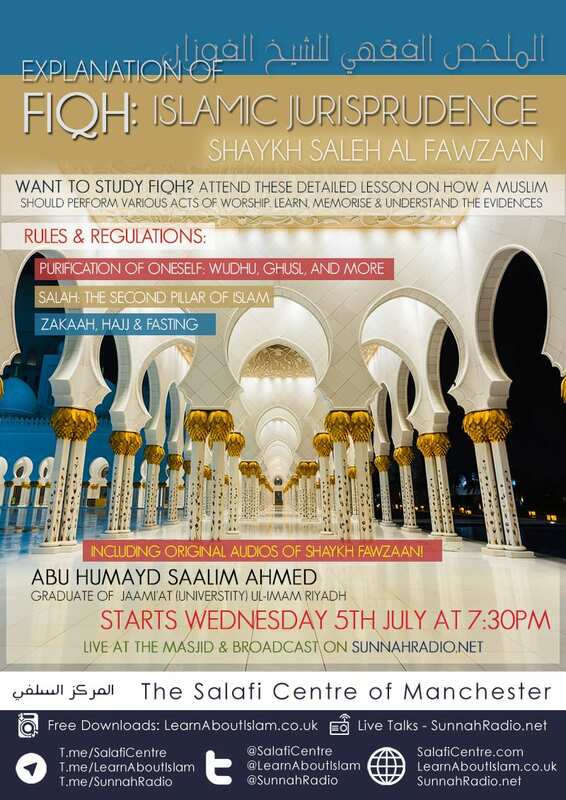 Want to study Fiqh? Annd these Detailed Lessons on how a Muslim should perform the various acts of worship, and the rulings and evidences behind them. Allah سبحانه و تعالى stated in the Qur’an “و إن تعدوا نعمة الله لا تحصوها” And if you would count the graces of Allah, never could you be able to count them. Truly, the blessings of Allah upon us are great, such that the scholars, such as Shaikh Mohammad bin ‘Abdul-Wahhab and others, have stated that from the signs of happiness in this world and the hereafter is gratitude to Allah for the numerous blessings He bestowed upon us. 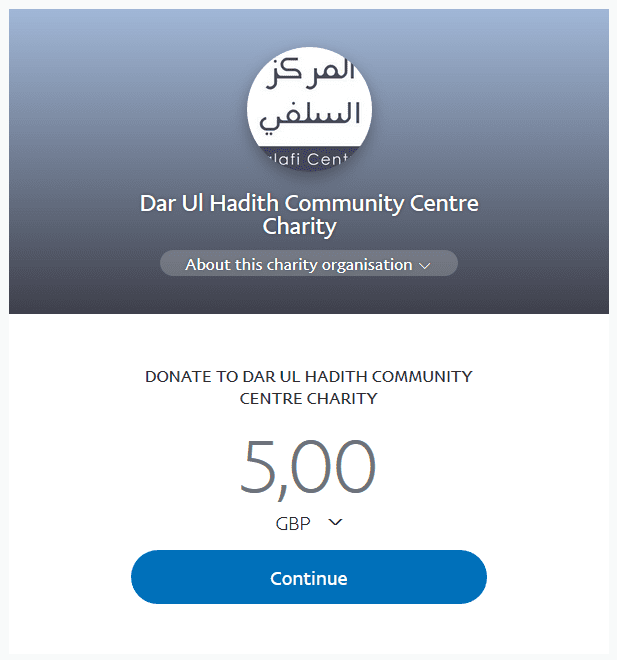 From such blessings that we demonstrate our gratitude to Allah upon is the establishment of the Salafi Da’wah in the Manchester region for well over a decade, with a masjid established, regular weekly lessons in ‘Aqeedah, Qur’an, Arabic, as well as the extremely successful Saturday School for children, and all praise is due to Allah. In addition, it is a blessing that an opportunity to expand the bounds of the Da’wah further in establishing a full time school has arisen. I encourage all our noble brothers and sisters to participate in this righteous project (of @salafi_school) and aid in furthering the Da’wah, in establishing an educational institute to raise our children upon righteousness; to raise them upon the way of the Salaf. 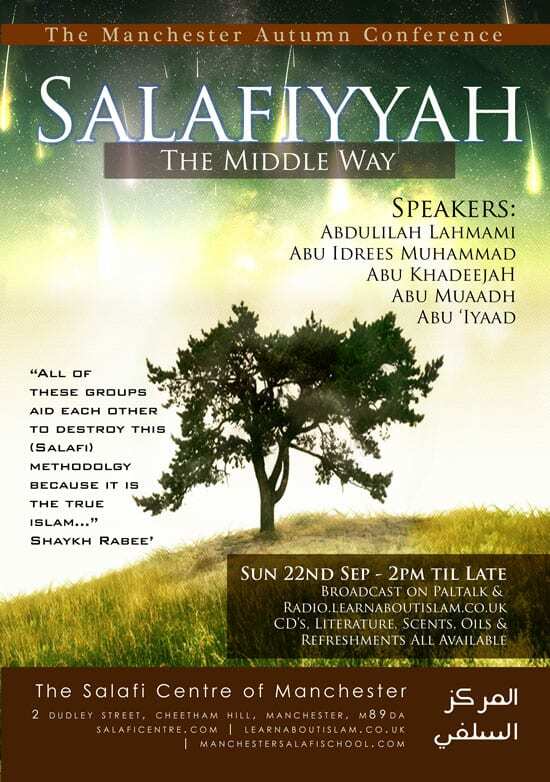 By the blessing of Allah, the Salafiyyoon from far and wide have united in aiding the establishment and progress of the da’wah in Birmingham – SalafiPublications, Bradford – AlBaseerah, as well as our communities in Cardiff and recently East London – Athariyyah…and this unification upon aiding the truth and it’s people does not cease, for indeed no project is ever at an end. We ask Allah to keep us steadfast upon the upright methodology, to maintain our unity upon the truth and to be in the aid of ahlus-Sunnah each of us to the other. CDs, Literature, Oils, Scnets, Refreshments will be available. Who is the student of knowledge?